ISLAMABAD, Oct 11 (APP): Newly-appointed Chief of Naval Staff Admiral Zafar Mehmood Abbasi visited Air Headquarters here on Wednesday. 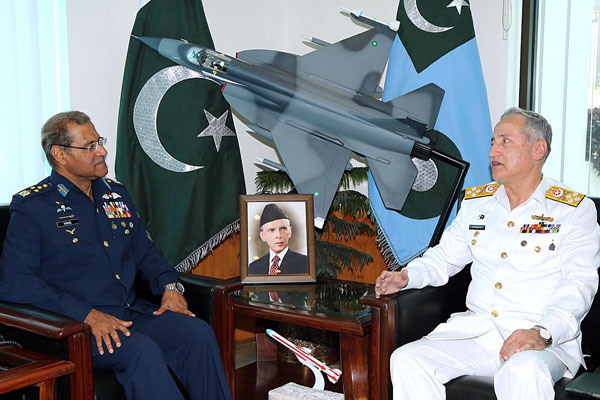 On his arrival at Air Headquarters, he was received by Chief of the Air StaffAir Chief Marshal Sohail Aman, a statement issued here by media directorate of Pakistan Air Force (PAF) said. Admiral Zafar laid a wreath at the Martyrs’ Monument to pay homage to the martyrs’ of PAF. He was also introduced to Principal Staff Officers of the PAF. Later on, the Naval Chief called on the Air Chief in his office. Both the dignitaries remained together for sometime and discussed matters pertaining to professional interests. The Air Chief felicitated the Naval Chief on assuming the command of Pakistan Navy. He also expressed the hope that Pakistan Navy would continue progressing under his able leadership. He reiterated his resolve to augment the existing synergy between the sister services and taking it to further heights.